The first inaugural City Arts Fest came to a close with a final night show by indie darlings She & Him at Seattle’s 5th Avenue Theatre. Rock concerts rarely ever take place at the 5th Avenue. 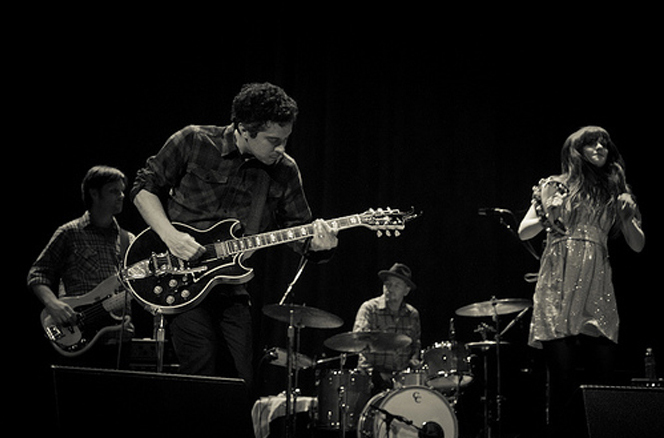 It was great to see and hear Zooey Deschanel and M. Ward in such a great venue. They were on their game all night delivering a much needed, heavy dose of sunny Brill Building by way of California folk-pop. Much of the audience who arrived early was grateful, I’m sure, for the large overhang at the entrance of the 5th Avenue as the first big fall storm started moving in a couple of hours before. While we were waiting for the doors to open it was nice to be able to get out of the rain. Once the doors opened, the audience entered the lobby and everyone was able to take in the oriental decor while enjoying a beverage or snack. The opening band, Mike Coykendall and the Golden Shag, took the stage precisely at eight o’clock to attempt to fire up the crowd. While Coykendall and his band were very technically talented their music came across as a quite derivative version of rock and roll. Coykendall’s vocals came across as a cross between Tom Petty and Michael Stipe. I kept trying to pick his own sound, own voice out from between all the influences but I wasn’t able to do it. Coykendall and the Golden Shag played a good half an hour of professional rock and roll but nothing you haven’t heard before. She and Him took the stage to deafening cheering and applause. This show was their first proper in Seattle and they didn’t disappoint. The audience love for the band was apparent as many in the crowd resorted to hooting and hollering with tons of “I love you Zooey’s” thrown in. I thought M. Ward was going to get left out of the love fest when I heard some guy a few rows behind me shout at the top of his lungs “I love you Matthew!” All was right with the world. Zooey took the stage bouncing and bubbly jumping around the stage while switching between vocals, tambourine, keyboards and ukulele. They proceeded to play through most of their material from their two studio albums and interacted with the crowd nicely. M. Ward shared an embarrassing story about asking a concierge what street the 5th Avenue Theatre was on, garnering a fair share of laughs from the crowd. 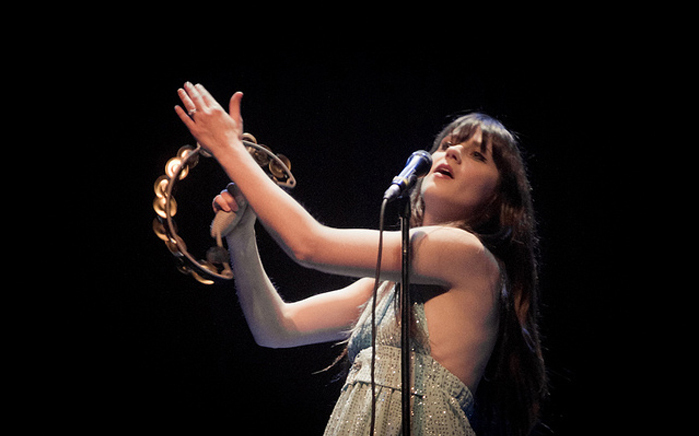 Zooey Deschanel referred to Seattle as her second home (she’s married to Ben Gibbard). One of the great things about She and Him is their ability to cover someone else’s song in a way that makes it completely their own. I was disappointed they didn’t play their wonderful cover of the Beatles’ “I Should Have Known Better” but they did cover Smokey Robinson’s “You Really Got A Hold On Me” featuring great vocal give and take between Zooey and M. Ward. The encore consisted of a couple covers that finally allowed M. Ward to let loose vocally and on guitar. They covered the Sonny West tune “Rave On,” popularized by Buddy Holly. To close out the show M. Ward let loose with his best Chuck Berry impersonation as the band tore through “Roll Over Beethoven.” This inspired the audience to shimmy and shake in the aisles, ending the show on a high note. The first annual City Arts Fest was over and I’d say it was a success. There’s a few things to iron out with the ticketing process and the biggest let down is the chronic overlapping of the musical acts. That being said the music lineup was one of the strongest I’ve seen for an inaugural festival and the additional art events and exhibits provided great opportunities to expand horizons and experience something new. I can’t wait to see what they’re planning for next year. Written by: Chris Senn on 11/09/2010. This entry was tagged 5th avenue theatre, Chris Senn, city arts fest, she & him, Show Reviews. Bookmark the permalink.